2017 marks the 50 year anniversary of the Camaro. I’ve been looking forward to this set for months now. I must say the artwork is killer for this set but the assortment leaves something to be desired. The best of the bunch is the all metal 67. It also features an opening hood. I would say the IROC-Z is next in line. I’m supper bummed that HW didn’t include my personal favorite the 70/71. Last year we got a Pro Stock $TH so I think it was lazy to include it with this set. I’m also not happy with the inclusion of two 2013 models. It would have been a much better batch with an early 70s and a current generation model. This is one set that will stay on the card as I love the artwork. I will be picking up a couple of the better examples to DLM and swap the wheels. 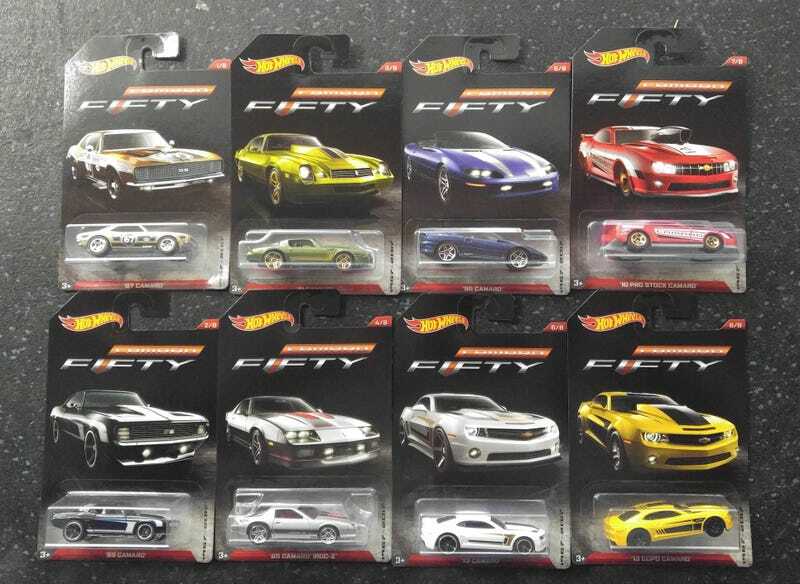 They hit several stores in my area today so if this is a set you want keep your eyes open they should be on the way.